The Lenovo ThinkSystem SR860 is designed for exceptional price/performance. It provides the speed and reliability you require today, with the scalability and versatility you’ll need tomorrow. When expansion is inevitable, data centers have to respond quickly. However, if that response is beyond your budget, system capabilities don’t really matter. If you are locked into an inflexible proprietary ecosystem that makes growth painfully expensive, you could face daunting choices between progress and budget. ThinkSystem SR860 is smartly designed to deliver affordable scalability in an industry-standard x86 platform. The SR860 is engineered to power through a wide range of workloads, from business consolidation to database virtualization, data analytics, and scientific/technical. Plus, the SR860 supports plenty of ultra-fast memory, storage, and adapter slots, as well as multiple NIC form factors, and even two GPUs. Many kinds of workloads can benefit from GPU-accelerated computing. The thousands of processor cores and parallel architecture make GPUs ideal for compute-intensive applications, such as machine learning, artificial intelligence, analytics, 3D modeling, and others that once required supercomputers. However, many servers that offer GPUs are far more expensive than the SR860, while comparably priced servers typically don’t offer GPUs at all. Lenovo AnyBay accommodates SAS, SATA, and NVMe storage devices in the same bays. This means you don’t have to have bays dedicated to either HDDs/SSDs or U.2 NVMe drives. AnyBay lets you mix-and-match as needed. Plus, storage can be tiered within the system for faster application performance, to provide the most cost-effective solution. The speed of NVMe drives makes them ideal for I/O-intensive applications that require high IOPs throughput and low latency, such as Big Data, OLTP, and HPC. NVMe can ease tight compliance windows for backup or replication, and improve VM density. One or two (mirrored) M.2 drives provide rapid OS boot that’s faster and more secure than either USB keys or SD cards, and free up drive bays for data storage. These are merely a few of the incorporated technologies that create the exceptional performance, scalability, and value needed for enterprise-class workloads, both today and into the future. Because your business depends on your systems, you need servers built for reliability. The ThinkSystem SR860 delivers multiple layers of reliability from the processors up, so you can have the confidence that you’re running your workloads on a platform built to stay up and running. Lenovo servers are so durable that they continue to be rated the industry’s #1 most reliableǂ, in addition to having the industry’s highest customer satisfaction§ rating. Predictive Failure Analysis—Identifies a failing component prior to failure, to enable scheduled parts replacement—rather than reacting after a failure—and minimize or avoid downtime. PFA alerts are available for all major components, including CPUs, DIMMs, adapter slots, fans, PSUs, storage devices, and voltage regulators. With reliability and security designed into the system, the SR860 builds on industry-standard technologies to deliver an economical, dependable platform for the most demanding users and applications. Lenovo XClarity Controller is the embedded management engine in all ThinkSystem servers that is designed to standardize, simplify, and automate foundation server management tasks. Lenovo XClarity Administrator is a virtualized application that centrally manages ThinkSystem servers, storage, and networking, which can reduce provisioning time up to 95% versus manual operation. Running XClarity Integrator helps you streamline IT management, speed provisioning, and contain costs by seamlessly integrating XClarity into an existing IT environment. ThinkShield is a comprehensive approach to security designed to secure the data center, from the foundation of your infrastructure to the network's edge and guard against a security breach. ThinkShield protects your business with each offering, from development through disposal. OS Support Microsoft, Red Hat, SUSE, VMware. Visit lenovopress.com/osig for more information. 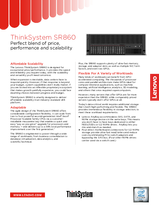 To learn more about the ThinkSystem SR860 enterprise server, contact your Lenovo representative or Business Partner, or visit lenovo.com/systems/servers. For detailed specifications, consult the SR860 Product Guide. * Based on Intel internal testing, August 2018. ‡ ITIC 2018 Global Reliability Report. § TBR x86-based Servers Report 2018. Trademarks: Lenovo, the Lenovo logo, AnyBay, Lenovo XClarity, ThinkSystem, and TruDDR4 are trademarks or registered trademarks of Lenovo. Intel®, Optane™, and Xeon® are trademarks or registered trademarks of Intel Corporation or its subsidiaries in the United States and other countries. Microsoft® is a trademark of Microsoft Corporation in the United States, other countries, or both. Other company, product, or service names may be trademarks or service marks of others. Document number DS0017, published November 28, 2017. For the latest version, go to lenovopress.com/ds0017.